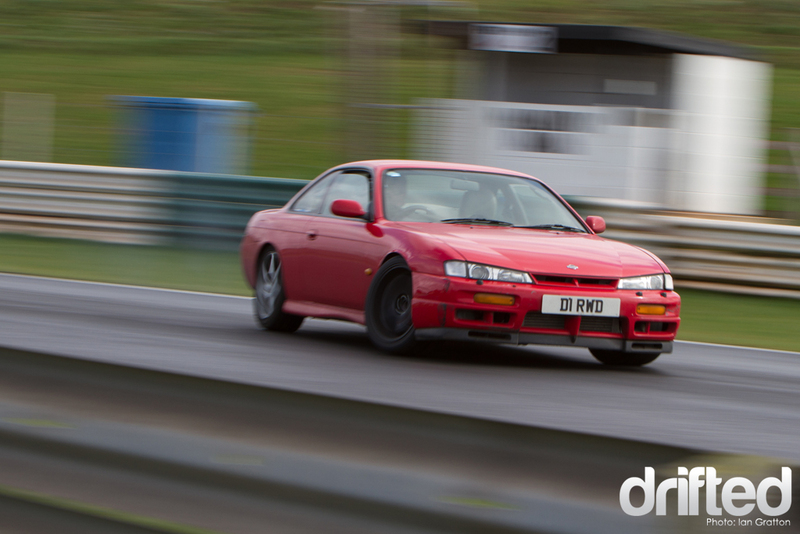 With the day off work I had a few hours to spare so I decided to pop on over to a full circuit drift day that was going on over at Mallory Park. Take the jump to see a few snaps from the day. Arriving a little late I joined a queue at the top of the circuit waiting for the session to break so we could get into the pits. After five minutes or so we were directed into the circuit to take the anti-clockwise trip round the track to to the infield. 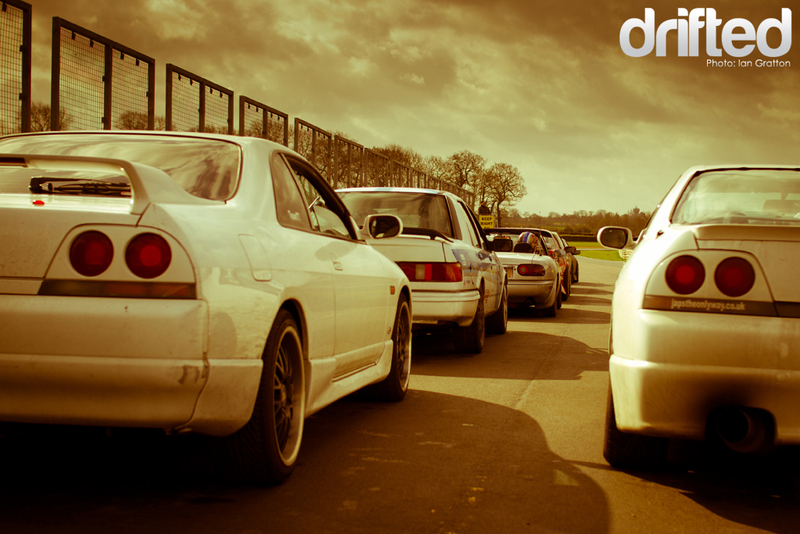 The pits were a hive of activity with plenty of drivers making the most of the monthly opportunity to drift at a proper circuit. Walking towards the top end of the pits you couldn’t help but notice Phil Maclachlan’s freshly prepared PS13. 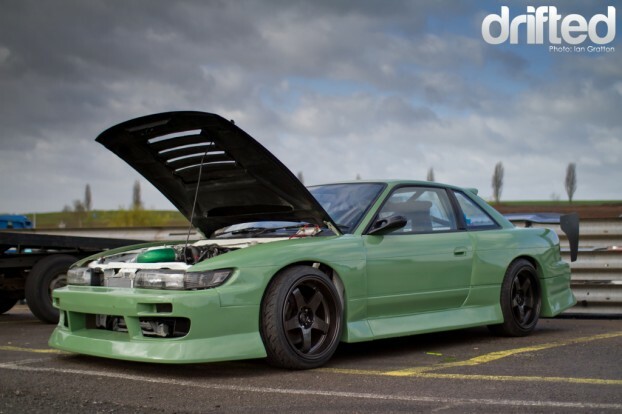 This Team Green car has been lurking in the Driftworks workshop for the past month or so and its nice to see it break cover. The car is powered by a mighty normally aspirated LS1 engine normally found lurking under the bonnets of Corvettes and Holdens. With so much power on tap the car must make for an awesome drive. 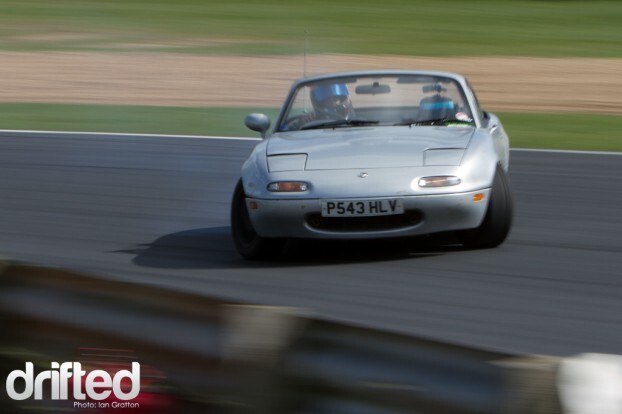 With the car being so new Phil took the opportunity of a day at Mallory Park to shake the car down and make sure everything was in good working order and reliable before any championship rounds take place. A few teething problems in the morning saw the car gently lapping the track – with the occasional attack round the chicane at the end of Gerrards. The car sounds awesome – with huge amounts of torque available low in the rev range it must feel so different to the smaller turbo charged engines normally found in these cars. Another thing I couldn’t help but notice is the sheer number of Drifted stickers on cars, helmets and equipment in the pits. A big thanks to everyone who shows their support – we’ve also recently just tipped over 5000 fans on our Facebook page – it means a lot to know you appear to like our drift coverage from around the world. Yet more start of season freshness in the pits to be shaken down ready for the start of the British Drift Championship. Steve Moore’s Kouki S14 looks completely different minus the graphics it wears during the season. I wonder if the car will look quite so clean and fresh at the end of the season ? A lot of drivers opt for slightly more casual attire at practice days but Steve was suited and booted. 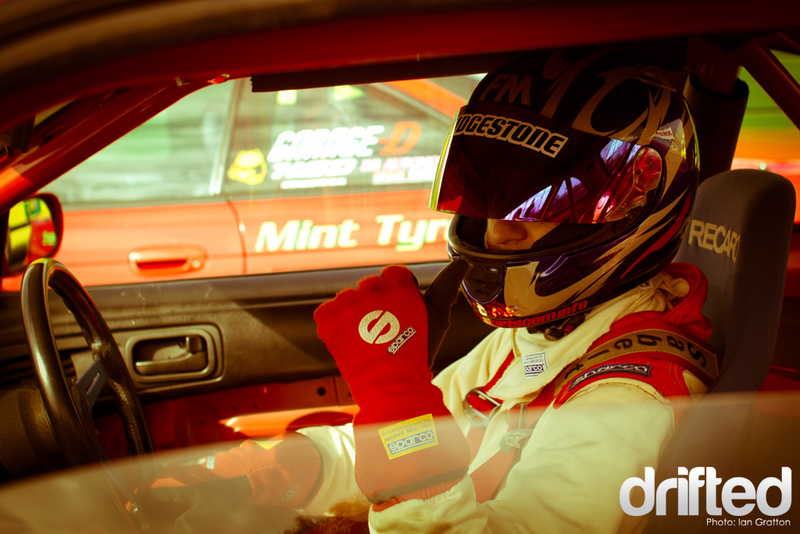 Its not as crazy an idea as you would think – firstly you don’t just catch on fire if something goes wrong and secondly it pays to spend a bit of time in your race togs and get used to how they feel and the extra heat that you’ll be subjected to in the car with a few layers of Nomex wrapped around you. Since our last visit to Mallory park in 2010 the circuit has undergone a full re-surface. Initially wet in the morning grip from the new tarmac would be unlikely to cause any major issues – so lets take a look at some of the action from the day. Before venturing towards the Apex of the now infamous Gerrards corner I hovered at the start of the turn. As always the Driftworks posse were in full effect at Mallory – being only a short(ish) drive from their HQ in Birmingham it would be rude not to make use of such a fantastic circuit – I knew the dampness wouldn’t slow these boys down a great deal and I was right – Paz initiating super early before the start of the turn with massive angle. 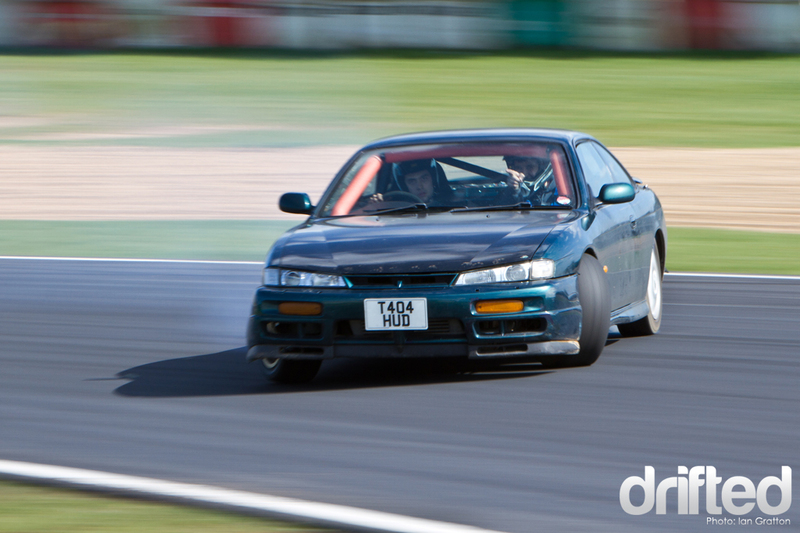 Chris drives this S14 just like he used to drive his Corolla – maximum attack everywhere. This fairly normal and unsuspecting s14a was been driven by 2010 British Drift Championship winner Phil Morrison – again – super super early entries and at good speed. 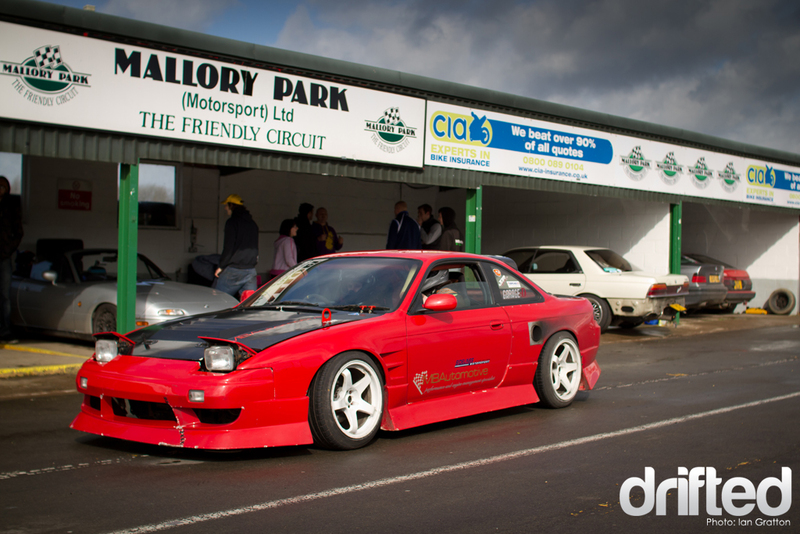 This car serves as one of the Driftworks test mules for new parts that will eventually make their way onto a LOT of cars running in the various championships in Europe. 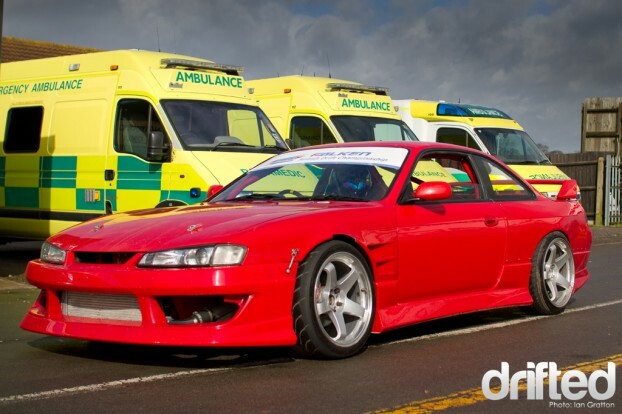 It will be interesting to get Phil’s take on this car at some point – it must seem so different to the Black Driftworks S15 which I’m sure you are all more than familiar with. This lightly breathed open SR20 engine is no match for the 2JZ engine in his normal car but the lack of power on tap certainly wasn’t holding Phil back. The dampness in the morning was causing quite a few people difficulties getting the entry into Gerrards just right – often causing sessions to end prematurely whilst cars were recovered back from the kitty litter. By this time it was noon and there was the natural break for lunch. The sun came out and dried out the circuit nicely for the start of the afternoon session. At this point it became really obvious just how much more grippy the circuit was. Drivers who had been comfortably sailing round Gerrards at previous events were now having to attack harder and carry more speed into the corner instead of just letting the car roll into over steer – weight shift and lots of speed are now essential here. Two cars that didn’t seem to be suffering quite so badly with the new found grip levels were the two little Mazda MX5’s belonging to Jay ‘Of the Factory’ Walker and Al Clark. Things probably aren’t so different for these guys as they need to be at maximum attack all the time anyway. I do know that Jay was running extremely high pressures in the rear tyres to help things along though. 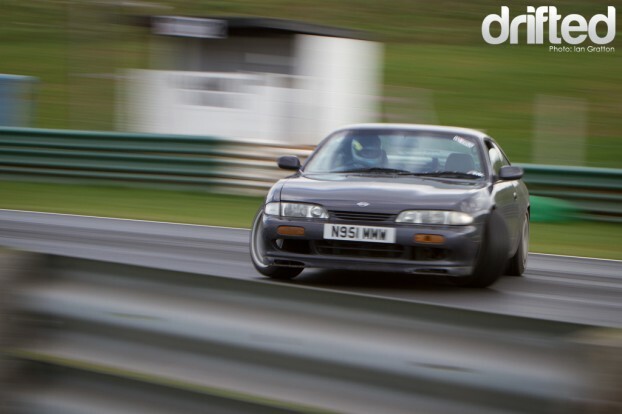 This Toyota Soarer had plenty of power on tap and was putting down some nice lines. After a few tricky moments in the morning the driver of this s14a had found his groove and attacking the big corner with some good speed. 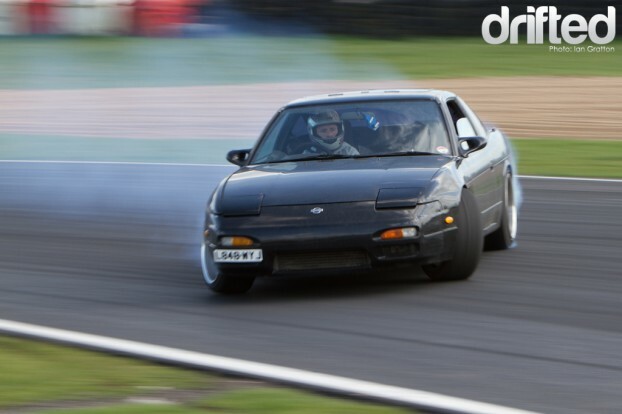 The owner of this black s13 was doing seriously seriously well round Gerrards – lots of speed and lots of angle waiting until absolutely necessary before backing off the gas to get the car ready for the entry into the chicane. 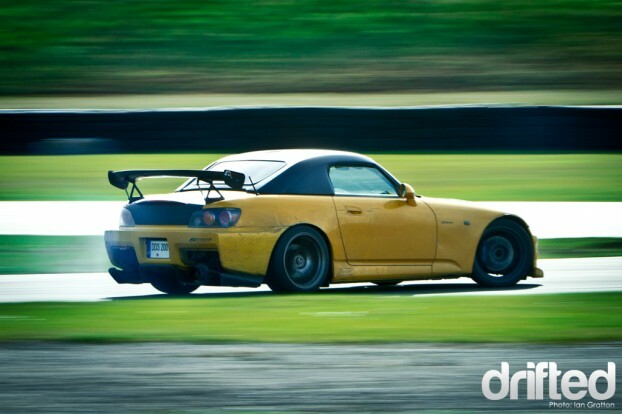 BDC Pro driver Ramunas Cepulis was having a ball in his extremely potent turbo charged S2000. These cars are notoriously stable and grippy – but the turbo charger helps out massively here. Myself and fellow AE86 owner James Gascoigne (incidentally, if you like AE86’s go check out his blog The Corolla Brotherhood) had taken a walk round to the far side of the circuit so we could see the cars make their way through the chicane at the end of Gerrards and make they way down the back straight. Unfortunately from here we watched Tony N’s turbocharged AE86 Trueno limp off the circuit and on its way home with a dubious death rattle coming from under the bonnet – hope you get her fixed soon man. Whilst James snapped away I selfishly watched huge flames guffing from the rear of Ramunas’ Honda as it shot down the straight at speed. I prefer my F20c engines in lighter cars in normally aspirated ITB’ed form – but its always nice to know these engines respond extremely well to forced induction in stock form and equally nice to see a car in competition that isn’t just the tried and tested Nissan platforms. Danni Murphy sailed by in her bottle green s14 – devoid of much of its livery whilst undergoing changes for this years season. Danni did extremely well out in Lousada back in 2010 taking AM 2nd place. Today the car was missing some of its rump as Danni had managed to get herself wedged on the tyre wall further down the track in the previous session. Unfortunately mid afternoon I had to leave and be back in the car fighting the late afternoon motorway traffic. Its always a real shame to miss the last few hours of a drift day – drivers are really at one with the circuit and their cars by this point in the day and its typically when they really shine. Hopefully I’ll get a chance to visit another FCD:MP day at Mallory soon. 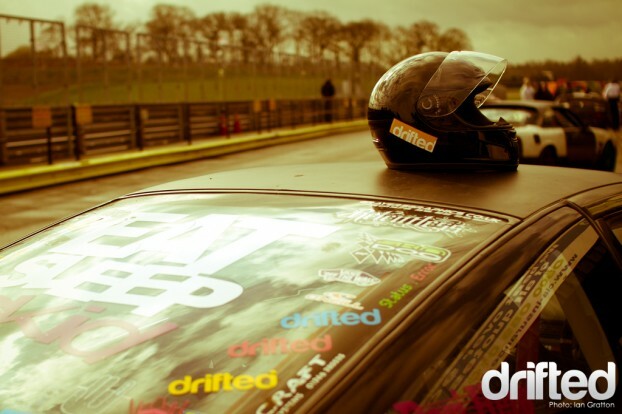 This summer sees Mallory park host the Festival of Awesomeness that is Driftworks AwesomeFest 2011. If you intend to book some track time for this event and haven’t visited the circuit yet you’d be crazy not to do some of these FCD:MP practice days before hand. 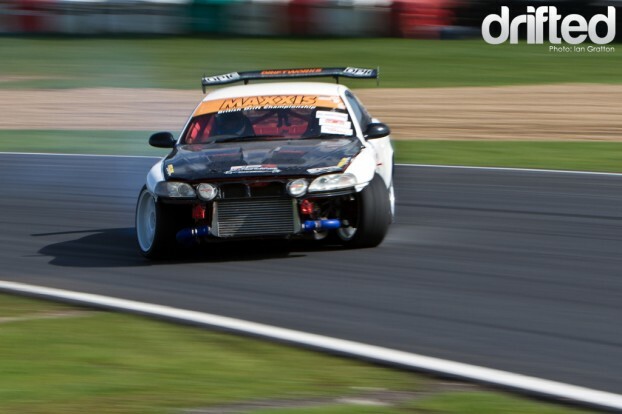 Keep an eye on the news and events section on the Driftworks Forum or the Awesomefest Website for more information.